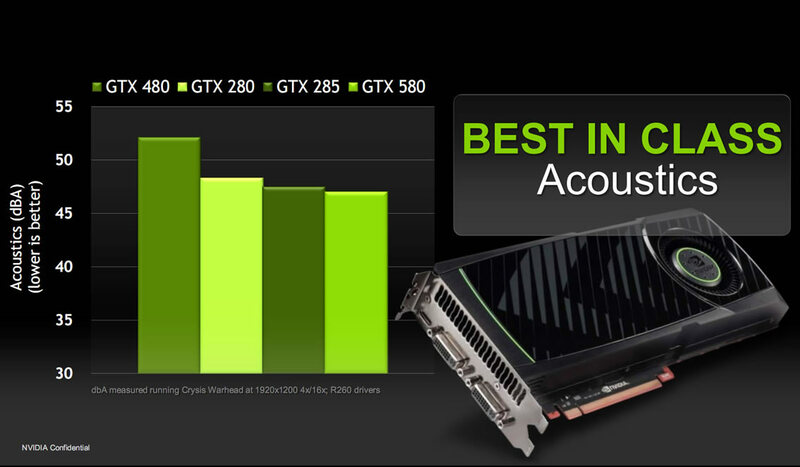 Nvidia has rolled out the red carpet for its latest flagship graphics card: the GeForce GTX 580. 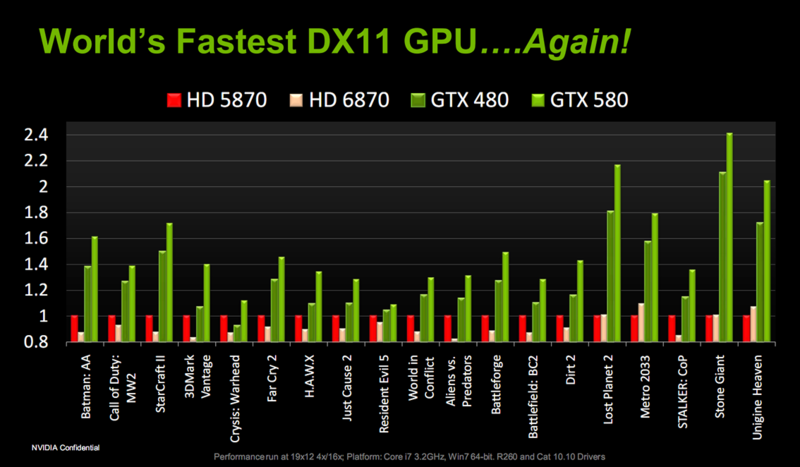 Touted as the world's fastest DirectX 11 GPU, the company has tweaked its GTX 480 to achieve a 20-30% performance-per-watt increase with a ~10 dbA reduction in noise. Its latest offering is reportedly a hair quieter than the GTX 280 and 285, largely thanks to a redesigned cover, a custom vapor chamber, and a more intelligent fan control algorithm. 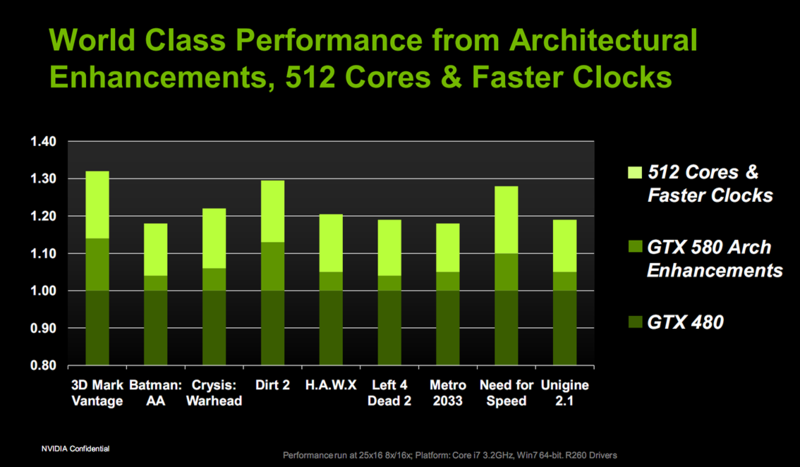 The new GeForce GTX 580 packs 512 CUDA cores with a graphics/processor clock of 772/1544MHz, 1.5GB of GDDR5 memory with a 384-bit interface and a data rate of 4.0Gbps. The 10.5-inch, dual-slot card draws a maximum of 244W over one 6-pin and one 8-pin PCIe connector and carries two DL-DVI outputs with one mini-HDMI port. Nvidia has also added real-time current and voltage monitoring to throttle performance and keep the card within its rated power spec. Nvidia has worked closely with the developers of Call of Duty: Black Ops (released just today) and H.A.W.X 2, so you can expect those titles to take full advantage of specialized features such as 3D Vision. The GTX 580 should be available immediately from $499, which is about $40 above the GTX 480's current e-tail rate. Nvidia recently lowered prices to combat the Radeon HD 6850 and 6870 and doesn't plan to make any further cuts, but you know how that eventually goes. 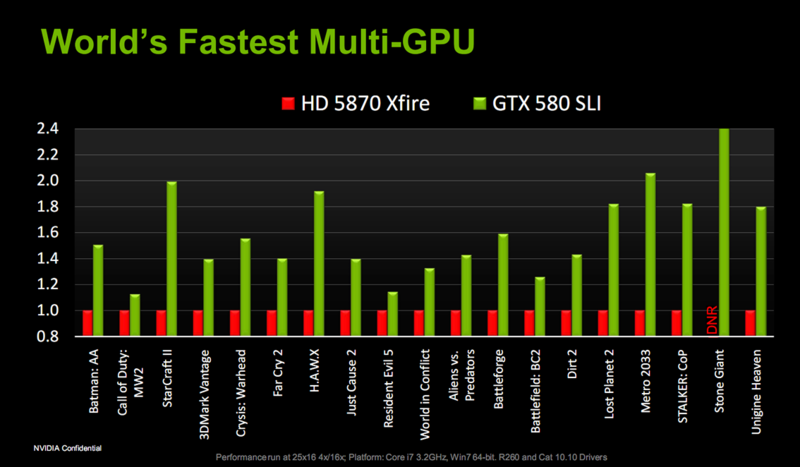 We should receive a sample of the GeForce GTX 580 this week, so watch for our full review soon. In the meantime, here are Nvidia's own numbers taken directly from their marketing/press deck, in other words, don't completely rely on these measurements but use them as reference to better understand where this new offering stands. You can also check some reviews hitting the wires today courtesy of Tech Report, Legit Reviews and PC Perspective. In addition to shipping its first GTX 500 series graphics card, Nvidia has launched a new community site. GeForce.com is still in beta, but the company hopes it will eventually serve as a centralized resource for Nvidia customers, instead of separate sites like nZone and SLI Zone. Along with relevant hardware and game news, a community forum, and GPU driver downloads, the site will offer a tool to help GeForce owners find optimal graphics settings for video games. Nvidia believes many people have a difficult time understanding video game performance settings, meaning that they may not be getting the most out of their new graphics card. To make your life a bit easier, the company has individually tested 10 cards and 17 games in 3 different resolutions to find the most optimal settings. Inexperienced users will also be able to have the site scan their GPU, but the OS, CPU and other system specifications aren't detected.